If our full-length Magic Dresses are too long for you, or if you're tall and a fan of long tunics,this playful two-layered DELICIOUSLY SOFT authentic Moroccan TAZA is simply FABULOUS! The luxurious fabric is just one of the many exquisite features of this impossibly soft dress, hand-loomed in Morocco, the y-u-m-m-i-e-s-t natural cotton/rayon blend that's truly the cashmere of cottons. 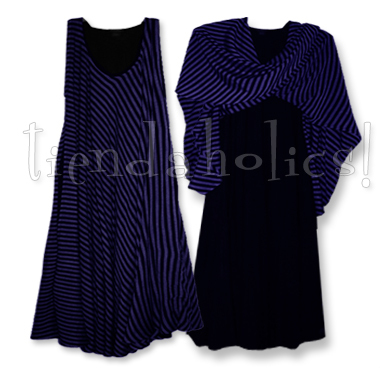 Once you feel this scrumptious, breathable organic fabric, you'll become a tiendaholic, too!